UCCFS Round 2: Reuben Sandwich(5) vs Turkey w/ Stuffing & Gravy(13) – I Love It Spicy! With the holidays now behind us and the memories of feasts still fresh in our minds, we turn our attentions back to the Ultimate Chilehead Comfort Food Showdown. Turkey with stuffing and gravy is the highest seed(13) still left in this tournament of comfort. A holiday meal for sure, but is it as comforting as one of the most popular sammiches to ever hit the delicatessen carving board? It is the strongest of 13 seeds for sure, and it easily dispatched Chicken Pot Pie in the first round. Maybe ranking it so high was a mistake, but it must prove itself worthy by taking it to the next round where the second highest seed, the Omelet (11) lays in wait to take on heavy favorite Mac ‘n Cheese. How great a matchup would that be either way? The Reuben is an awesome sandwich and there are a few varieties that people can go to. I have had a mixture of pastrami, corned beef and turkey in the past. 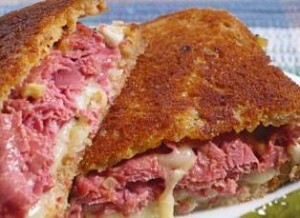 Add in the juiciness of the sauerkraut, the melted swiss cheese and the tantalizing thousand island dressing between 2 pieces of rye bread to create a blend from the sandwich Gods. Turkey with stuffing & gravy might be a great yearly or bi-yearly feast, but is it a comfort food for the rest of the year? You must decide!